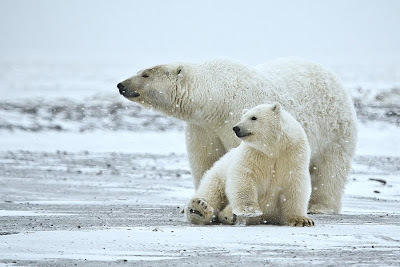 A symbol of the North Pole, polar bears are the world’s largest land predator and biggest member of the bear family. With heavy fur, blubber up to four inches thick and black skin that absorbs heat from the sun, polar bears are amazingly well adapted to the Arctic climate. Interestingly, a polar bear’s fur is transparent. The long, coarse, guard hairs that protect the plush thick undercoat are hollow and transparent. The thinner hair of the undercoat is not hollow but they, like the guard hairs, are colorless. Want to watch polar bears at play in their own environment? Join Discovery Student Adventures for an amazing 16 day journey to the Arctic! What’s your favorite Arctic animal? Polar bears? Walruses? Beluga whales? Something else?